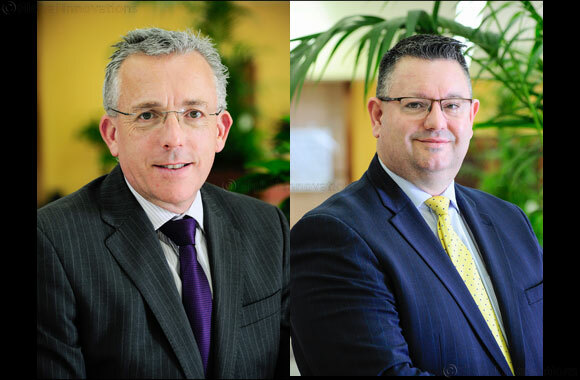 Abu Dhabi, United Arab Emirates- 07 February 2019: Abu Dhabi University (ADU), an internationally recognized academic institution for quality education and applied research, has announced the appointments of Ian Mathews as Vice Chancellor for Administrative and Financial Affairs and Professor Phil Hamill as Associate Provost of Student Success. Mr. Mathews served as Chief Financial Officer at Trinity College Dublin (TCD), Ireland’s premier University, for more than 24 years. As statutory officer and key member of the leadership team, he was accountable to the Board for the overall management of the University’s financial affairs. Under his leadership, the finance team won numerous accolades for their innovations and achievements across Ireland and in the United Kingdom. Professor Hamill was previously Director of the Learning Division at the Emirates Institute for Banking and Financial Studies in the United Arab Emirates and has held senior academic roles at leading Irish universities including Queen’s University Belfast, Ulster University and the Institute of Banking – University College Dublin (IOB-UCD). Professor Ahmad added, “Appointing outstanding leaders at the top of their fields is of the utmost importance to ADU to help us achieve our strategic objectives. They join a strong leadership team, which has recently been strengthened by the appointment of Professor Christos Pitelis (Dean of the College of Business), among other academic and administrative leaders. Students are at the heart of everything we do at ADU, and these appointments will ensure that our resources and people enable outstanding success and an unparalleled student experience’. Mr. Mathews is a chartered accountant, having trained with PricewaterhouseCoopers (PwC) in Dublin. He holds a bachelor’s in commerce and a diploma in professional accounting. He is also a Fellow of the Institute of Chartered Accountants in Ireland. After earning his bachelor, master and doctoral degrees and a Postgraduate Certificate in University Teaching from Ulster University, Professor Hamill has held roles as Lecturer, Professor and Dean in leading Irish universities (Queens Belfast, Ulster, University College Dublin). He is a member of the Chartered Institute for Securities and Investment. His work has been published in leading finance and accounting journals including the Journal of Empirical Finance, Quantitative Finance, British Accounting Review, the Journal of Corporate Finance and the Financial Review.